A gratifyingly near-full house at Blackheath appreciated a rare appearance by the veteran violinist Mark Lubotsky, whose authority was undiminished since I heard him introduce to London the Schnittke Quasi una Sonate dedicated to him. That brought the shock of the new to the Almeida Festival of contemporary music in the '80s (?) and decades on replicated its effect with the Blackheath Sunday morning regulars, who are becoming more accustomed and receptive to newer music. It was a tremendous, uninhibited performance, with the lid thrown open, and crashing cluster chords drawn from the piano shaking the floor, the audience agog for each unpredictable musical event. In Mozart one enjoyed Lubotsky's care and discretion in what is really an accompanying role, but Dmitry Winnik, a powerful Russian-trained pianist, is not a Mozart stylist, and this was the least satisfying item in an otherwise rewarding programme. The Franck went well, with the lid down on short stick (generally a mistake, but balance was good). 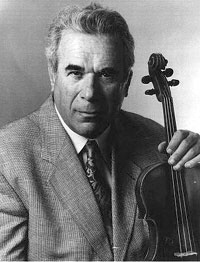 Lubotsky has superlative bow control and a keen ear; he was perfectly aware of the occasional note not exactly as it should be, and there was nothing in this concert that would not have made a good CD with minimal patching. Most memorable of all for some of us was the lovely unaccompanied Stravinsky Elegy (originally for viola, 1944) which brought a rare moment of calm. In the same evening, there was a lavish Russian Cello Spectacular * at Wigmore Hall, dedicated to the memory of Boris Pergamenschikow, and presented by the Violoncello Society of London and Academia Rossica. Six fine Russian cellists, David Geringas, Leonid Gorokhov, Natalia Gutman, Ivan Monighetti, Sergei Suvorov and Alexander Rudin (who also played the piano with Natalia Gutman) gave a well balanced programme of music by Prokofiev, Tchaikovsky, Schnittke, Vasks, Penderecki, Rimsky-Korsakov, Arensky and Golovin at which it was a privilege to be present amongst a packed audience of knowledgeable musicians; there were a score and more cellos filling up the cloakroom! The other accompanists, both of whom made trojan contributions, were Alexander Satz (who had a deft and delicate way with Schnittke's Suite in the Old Style) and the British pianist Caroline Palmer who made much of the orchestral accompaniment to a Rimsky Coq d'Or Fantasy. The six superb cellists gave a sequence of all too short performances, the second half appropriately lighter, with each artist distinctively individual in style and tone quality. All of them had given their services free for master classes at RAM earlier in the day. A feast to remember! By way of a 'spin-off' from the cellists' evening, Prof Alexander Satz gave a public master class at the Guildhall School, and it was fascinating to follow how he developed the interpretations of Beethoven and Prokofiev by three gifted women students. His method is strikingly intuitive and he conveys what he seeks by gesture and metaphor - "naturalness" above all - as well as illustrating what he wants at the keyboard. Not a note in the 'simplest' passages of Beethoven's Moonlight and Funeral March sonatas escaped his attention, and we all learned to hear (and play) this music better, trusting the composer and avoiding any striving to make it 'not boring' at all costs. 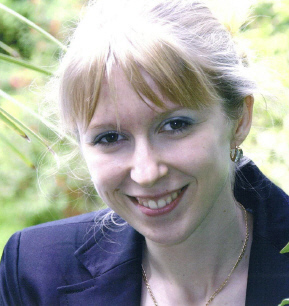 Elena Vorotko (pictured) was encouraged to take a broader view of the challenging 8th Sonata of Prokofiev, scaling climaxes within the whole, and seeking always an overall perspective. Already a formidable recitalist and a woman of many musical parts (composer, specialist in early keyboard instruments - preparing for her PhD a comprehensive digital edition of Bach's 48; and for Musical Pointers an analysis of the Diabelli Variations) she can be heard next week at Oxford (Bach, Prokofiev 8 etc) and in January as a PLG Young Artist. Three days later Prof Satz spent another gruelling full day teaching (starting at 9.30, finishing twelve hours later!). At the Royal College of Music's evening Ricci Foundation Master Class Satz had a second Steinway alongside his pupil's piano, and illustrated his thoughts copiously, sometimes playing along with his 'victim'. Although he was always courteous and encouraging at first, he subjected them to what often seemed impossible demands for immediate response, usually of a subtle musical nature, often described in metaphor and not unkind caricature, especially seeking to combat too rigid and mechanical rhythm. He tried to distinguish how even one and the same phrase (or even a single chord) should sound quite differently if it were by Medtner, Prokofiev or Scriabin. Time ticking away was the enemy and one wondered why some of the candidates chose such overwhelmingly demanding and lengthy works as e.g. Medtner's Sonata minacciosa (Hiroaki Takenouchi - PLG Young Artist 2004). Having mastered and internalised its daunting pianistic complexities so commendably, it was hard for him to vary character and overall dynamic structure on demand, and think through the 'long line' which he'd also wanted in Prokofiev No 8. Of those I heard, Tanya Gabrielian (pictured) was better able to reach deeply into the essential Spanish romantic character of Granados (El amor y la muerte) and one felt her interpretation grow by the minute. Mei Vi Foo (2005 Ricci Award winner) gave an impressive if idiosyncratic account of Scriabin's Sonata No.4 and was confronted politely with the hardest task of transformation, which I think she understood, if not necessarily agreeing with totally. Towards the end, the Professor confessed he too was tiring, and perhaps he did too much general talking around related subjects (which gripped the audience), illustrated by his astonishing ability to think at the keyboard, and to quote from any composer's works, piano or orchestral music, all available instantly to his fingers. Occasionally he seemed to be self-communing, and maybe left his pupils waiting a little too long for their own lessons to proceed? One thought for future master classes, it would be a great help if score copies might be made available to the listeners - maybe a few pages of each work being studied would suffice, as the teaching was more general as to character than page by page specific. It appeared that the RCM class was being recorded, and the subjects themselves, not to speak of the 60 or so students who attended as listeners, would gain from listening to Prof Satz's wise expositions again.